Well, maybe not. Laying out the curves and getting the size right for the location was the easy bit. 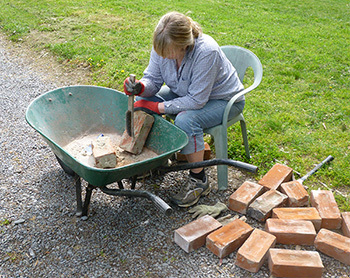 Cleaning the trailer-loads of used bricks was OK (sore hands, but not a problem). Aha! NGP finds the words 'you' and 'help' quite alarming when they appear in the same sentence. So when he got home that evening he took me aside. Really, my mortaring wasn't bad for a beginner. It was, after all, my first time, and I'd get better with practice. Actually, it looked jolly good... Maybe, NGP, maybe. I know when you're trying to wriggle out of something. Well, it took me a month, but now it's finished - my very own strong, rough-rustic brick spiral. I've filled it with topsoil and planted a variety of herbs and flowers. I love it. I love that I've built it on my own. 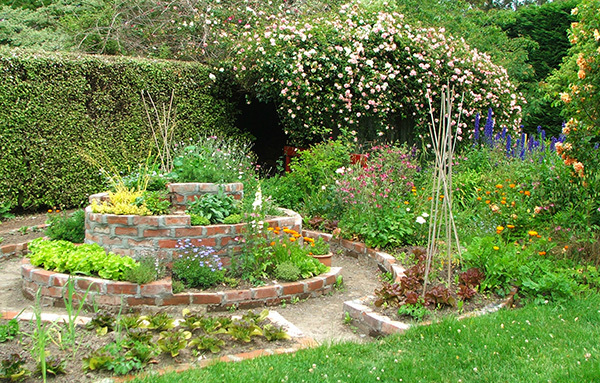 And I've turned more of those bad-memory earthquake bricks into something beautiful and positive. That's a priceless feeling. Enjoy! Rusty the dog and the Head Gardener sitting on the spiral courtyard. 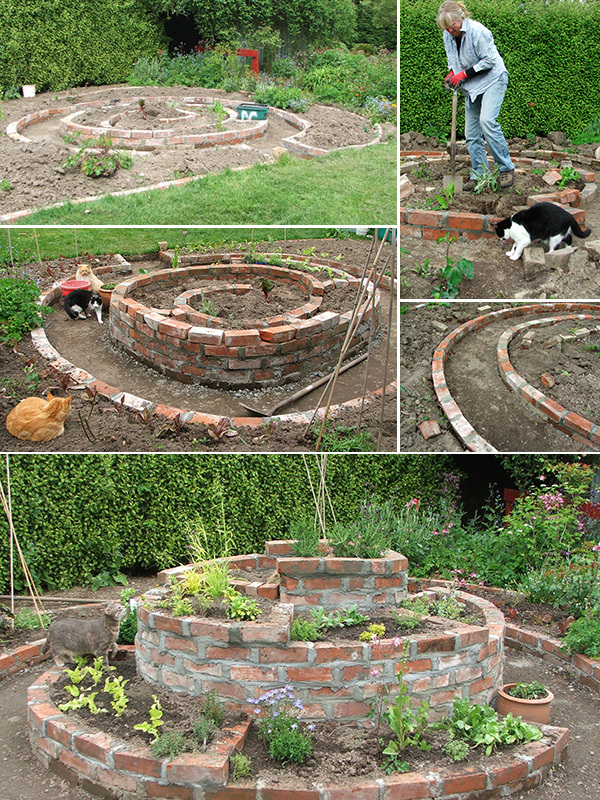 My first garden feature built with earthquake bricks was also a spiral, a flat courtyard in the Dog-path Garden. All the bricks are over a hundred years old, and were part of Son of Moosey's house, in a wall which crashed to the ground in the Christchurch earthquake of 2011.